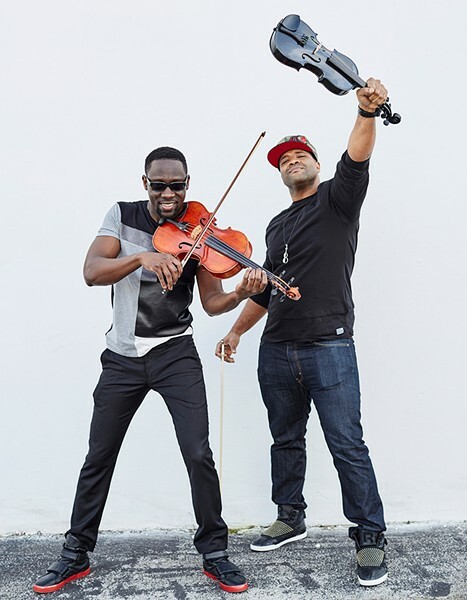 Black Violin perform on Thursday, Jan. 31, at Luther Burbank Center for the Arts, 50 Mark West Springs Road, Santa Rosa. 8pm. $35–$45. 707.546.3600. Kevin Sylvester, known as Kev Marcus in the duo Black Violin, has been looking for a new house near his longtime home of Fort Lauderdale. He got a few laughs from the process. "The Dolphins training facility is, like, five minutes from where we're moving," says Sylvester, who is six-foot-two and a muscular 275. "This Realtor, he was like, 'So, are you playing for the Dolphins? What are you doing?' And I'm like, 'No, I'm actually a violinist.' I love that moment when they're just not expecting to see that." Marcus' counterpart in Black Violin, Wil Baptiste (Wil B. ), is also classically trained and also six-foot-two, although more of a slender build. And they relish the idea that they're breaking stereotypes in the way they bring together classical, hip-hop, soul and pop in their music. Before they could introduce their unique musical hybrid, the duo took a side trip. In 2004, Marcus and Baptiste won three rounds of Showtime at the Apollo, and while in New York for that show, they got the opportunity to meet with Alicia Keys. She asked the duo to join her band for a performance during the 2004 Billboard Music Awards, a performance that opened the door for Marcus and Baptiste to land jobs in the touring bands of several big-name acts, including Kanye West, Jay-Z and Linkin Park, as well as Keys. Eventually, though, the two decided they couldn't abandon the dream of making their own music. That meant focusing on Black Violin. The career move seems to be working out. Over the past year or so, the duo have built a presence writing music for commercials, television, movies and other media. Meanwhile, their audience grows with each new release: Black Violin (2008), Classically Trained (2012) and Stereotypes (2015). The most recent album shows considerable growth, as the synthesis of classical violin and hip-hop (with bits of pop and soul filtered in as well) becomes more seamless and dynamic. Black Violin have a new album finished and may preview some of the new songs on tour this winter. As on recent tours, Marcus (on violin) and Baptiste (on viola and vocals) will be joined by drummer Nat Stokes and turntablist extraordinaire DJ SPS. "The four of us combine to really give a show that we can basically guarantee you've never seen anything like it," Marcus says. "It ends up being a great show."